If you've never heard of Amadeus Awad, I'm not surprised. 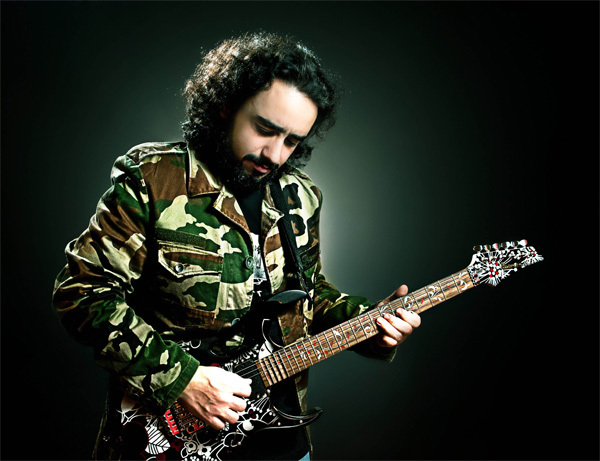 The Lebanese guitarist and composer, while mostly recognized in the Middle East and Europe, has basically been flying under radar. And this is despite two albums, one EP, and collaborations many other significant musicians in the metal world. 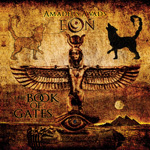 He arrives with a second EP, in special edition, The Book of Gates, under the moniker of Amadeus Awad's Eon. It's a special edition because it includes all three tracks from the previous EP Schizanimus. 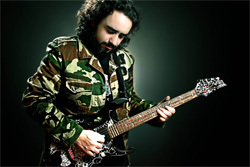 Once more Awad has enlisted some A-list talent to help him including Elia Monsef (Ostura), Russel Allen (Symphony X), Amanda Somerville (Trillium, Avanatasia, et al), Kevin Moore (OSI, Dream Theater, Chroma Key), and John Macaluso (Yngwie Malmsteen, Ark, et al), among others. Obviously, as you would expect with his name on the product, the album is about Awad's song composition and guitar playing. The songs across both EPs fall into more traditional melodic progressive metal with Middle Eastern nuances and maybe some slight power metal spice. The compostions are adequately intriguing, but never with some overbearing technical complexity. Instead, they drift between heaviness and lightness, offering rich arrangements wrapped in strong melodies, like an intersection of Symphony X and Dream Theater. As a guitarist Awad easily shifts between acoustic and electric for his fret expression. For the latter, he's definitely also in the classic tradition of guitar players, mixing in neo-classical references. Some of his earliest influences come from Ritchie Blackmore, so you have some sense of his foundations and where he has come. All these elements find a quite balanced expression in the The Book of Gates songs which, it appears, has some Egyptian conceptual theme. The result is that Awad has that unique talent of making music both compelling for like minded peers and, while appreciating that, entertaining for those of us who like well-conceived melodic progressive music. Though The Book of Gates is gettin the push in this promotion, I think my favorite song was from Schizanimus, namely Poetry Of Time. It has this Awad's strong guitar work, both acoustic and electric, within a symphonic layer, but bolstered by the impressive drum work of Gavin Harrison (which nearly steals the show). Overall, however, all the songs are rather impressive and entertaining. Fans of both virtuoso guitar playing and melodic progressive metal will appreciate The Book of Gates. Easily recommended. Fans of both virtuoso guitar playing and melodic progressive metal will appreciate The Book of Gates. Easily recommended.